Kee Cover is a modular system incorporating the strength and reliability of Kee Klamp® fittings and tubes and a mesh panel. 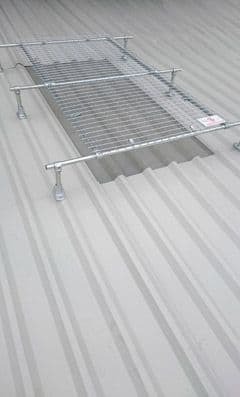 The system can be constructed while on the roof so is delivered in component form, thus making it easy to transport up to the roof. Installation is quick and easy, keeping costs down. All components and mesh panels are hot dip galvanised for enhanced durability. The tube can be also colour coated if greater visibility is required. The Kee Cover range features two models, both of which are compatible with trapezoidal and standing seam roofs. The Standard Model fixes virtually flat to the roof surface, it has been designed to be permanently secured directly over the roof light. The Raised Model is mounted above the skylight to give a greater distance between the mesh panel and the roof light so that in the event of a fall the Raised Model will support the weight without damaging the skylight. Standard Kee Cover panels are 2m long and 1m wide, but extension panels are available, ensuring the roof surface is safe. Variable height facility allows for use over different shaped roof lights. Both Kee Cover models have been tested in accordance with the ACR Red Book and BS EN 1873.